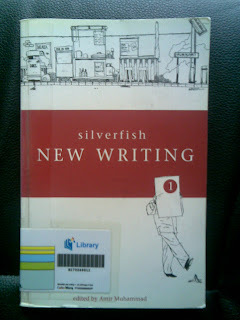 New Writing was published in 2001 by silverfishbooks. It is a collection of works in English by writers from around Singapore and Malaysia. At the time it was quite a risky business proposition. Was anyone going to buy a book like this? Mainstream sentiment was generally quite negative towards works in English (either because the national languages held more prestige, or a perverse expectation that local writers by definition couldn't be any good if they used English). Well, with six editions now in print, I think the critics have been silenced and the series has I think given the local writing scene more self-confidence. I recently went back to read some of the stories in the first edition. I like the little sketches of life. Either contemporary such as Hong Wee's The Drive Home, or reminiscing on the past as in 14 Leech Street by Bernice Chauly. Of course must pay homage to the local fascination with ghost and zombie stories with Kaysidayat bin Ishak's The Last Train. Or something a little more tender and juicily experimental like Plat du Jour by Muslin Abdul Hamid. And much more. Pick any book in this series to try something new and different. Its a bit like nasi padang - get to sample a whole range of small dishes with great local flavour.